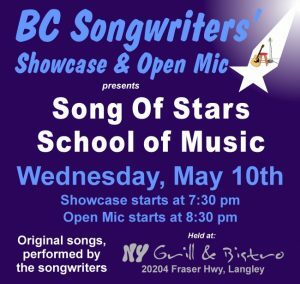 On Wednesday, May 10th, the BC Songwriters’ Showcase Association is pleased to feature performers from the ‘Song of Stars School of Music’ for the Songwriter Showcase, starting at 7:30 pm. Open Mic follows at 8:30 pm, with an opportunity for songwriters to perform a couple of their original songs. 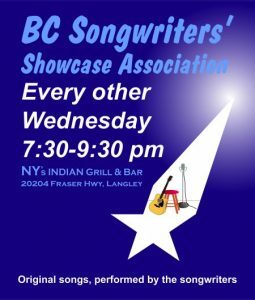 It all takes place at NY Grill & Bistro – 20204 Fraser Hwy, Langley.